In the debate between iCoffee Mozart vs Opus, which one wins? Well…maybe neither. The iCoffee Mozart and Opus have both been discontinued. You can still find them, but you might not want to. Keep reading to see a list of features, pros, cons, and why you may want to broaden your search to include other options. Should You Get the iCoffee Mozart or Opus? 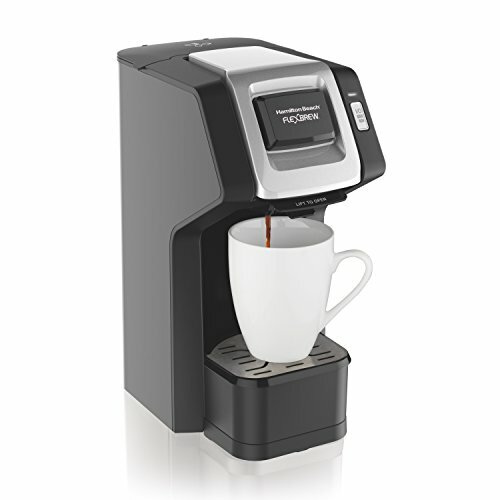 The iCoffee Mozart is a versatile, convenient machine that’s reminiscent of the classic Keurig in aesthetics and style. 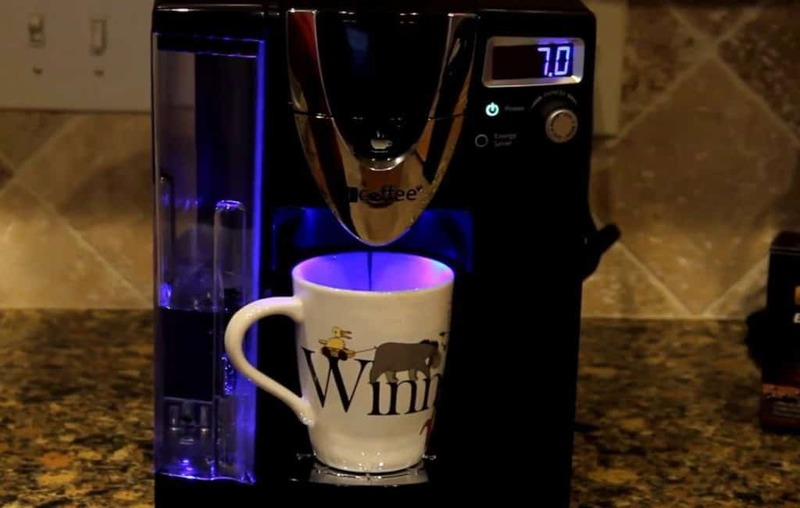 Want a single cup of hot, delicious coffee brewed in a minute or less? This one could accomplish that. As mentioned above, iCoffee went out of business. Though you can still find their machines—including the iCoffee Mozart (and Opus)–in some stores and from a handful of sellers online, good luck with any warranties, broken pieces that need to be replaced, or any type of support you might need. If you do decide you want to buy one anyway, check Amazon before making a purchase. At the time of this writing, they do not have the most reasonable prices on the iCoffee Mozart I’ve seen, by far. However, there are more than 400 iCoffee Mozart reviews to read through to make sure you’re making the right decision. A lot of people loved their iCoffee Mozarts, but there are some reports of machines that didn’t even make it a year before they stopped working. The prices could drop, too, though I doubt they’ll go low enough to justify the purchase. How low would they have to go for you to think it was worth it to buy the iCoffee Mozart? Like the iCoffee Mozart, the Opus was a single serve brewer with some features that made it convenient and fun to use. The prices on this one are a little lower than the Mozart ones that I saw, but still nowhere near worth it. For comparison’s sake, let’s see what it had to offer. Yep, that bad news above applies here, too. You could buy the iCoffee Opus, but you’d be better off looking for a different coffee maker from a brand that’s still in business. Even a great deal on a coffee maker at the time can turn into a bad one as soon as something major goes wrong. Well, they have a lot in common. Both have been discontinued, so there’s no clear winner on that one. They could take K-Cups and make coffee relatively quickly. Opus has a slightly bigger reservoir, at 75 ounces compared to 72. Both would brew up to 12 ounces of coffee, in half-ounce increments. Both have hit-or-miss reviews; some people loved their machines and had no problems, while others had trouble either right out of the box or a few months into the machine’s use. There’s really no huge difference between the two coffee makers in the iCoffee Mozart vs Opus comparison. Either would get the job done (as long as you didn’t get a lemon). They both seemed to make great-tasting coffee. If you were to get a working machine at a reasonable price—either of them—you probably wouldn’t be disappointed. It’s when things start to wear out (sometimes sooner than later) that the problems start to appear. Honestly? Neither. Maybe if you find a brand new one for less than $20.00 at a garage sale, you should (in that case, either one will do) buy that one, but even that comes with risks and you could be out $20.00 either immediately or in a couple of months. You’ll just have to decide if the risk is worth it for you. 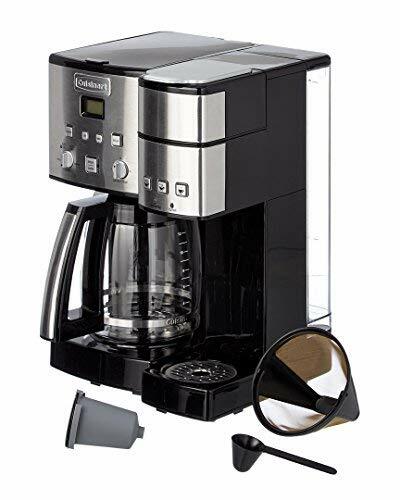 Between the number of complaints that they’ve stopped working, are too hard to clean, and people’s general disappointment in the machines even when they paid the normal (usually less than $70.00) price, I highly recommend looking elsewhere for your next single serve coffee maker. I will point out that eBay has the most reasonable prices (at retail or just below) at the time of this writing. You could go there and make an offer to get one at a lower price. A lot of sellers (more so in other places than on eBay) are trying to take advantage of the fact that the machines have been discontinued and sell them for much higher than retail prices. You could get top-of-the-line current models for almost the same as what some people are asking for the iCoffee Mozart and Opus. Luckily, there are plenty of options on the market that have comparable or superior lists of features. These models are around the same size as the iCoffee Mozart and Opus. In some cases, they’ll take up even less room on the counter. 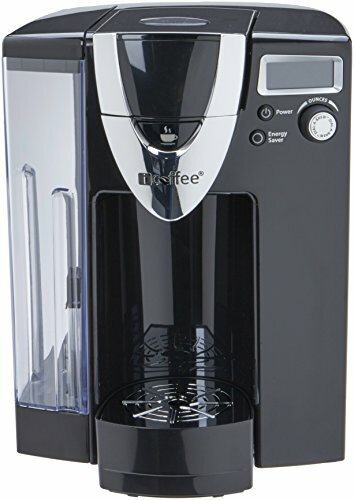 It makes sense that the K-Classic™ Coffee Maker would be a viable option, since the iCoffee Mozart and Opus both were single serve brewers that could use K-Cups. It’s about $120.00, but you may be able to catch this one on sale pretty easily. The water reservoir will hold 48 ounces. That’s significantly less than the iCoffee Mozart and Opus coffee makers, but if you don’t need a lot more than that, this is still a great option. It makes coffee in a minute or less, a cup at a time. You can only make up to 10 ounces of coffee at a time, though. If you wanted 12 or even 14, you’ll have to go with another option. Get it in rhubarb (red) or classic black. It costs about $150.00 (Check out the latest rates here!) and holds 72 ounces of water in the reservoir, similar to the amounts the iCoffee Mozart and Opus held. It also uses the K-Cups just like they did. In addition, it comes with its own reusable filter cup so you can use your own coffee. It makes 5 to 12 ounces of coffee at a time, but not in the half-ounce options the Mozart and Opus did. Use the hot water option for soups, hot chocolate, tea, etc. It’s easy to clean, has a gorgeous blue LCD screen, and a removable drip tray for fitting bigger mugs. The overall design is sleek and looks a lot more modern than the iCoffee Mozart and Opus did. It’s programmable and has auto shut-off. You can also adjust the temperature. The Cuisinart Coffee Center isn’t exactly the same. It will actually brew a pot of coffee, too. If you were looking at single serve machines but wondering if you’d ever need to make a whole pot, this might be the perfect medium you were hoping for. 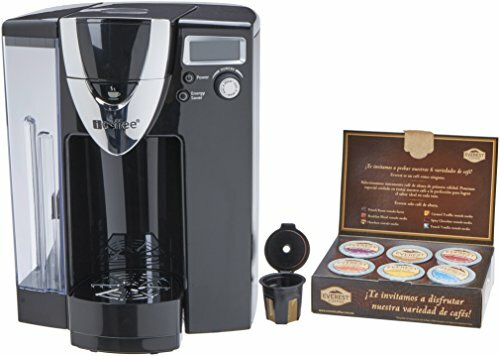 One drawback to this model is that it’s only able to make 10 ounces of coffee on the single serve side at a time, which is a little less than most other coffee makers. The reservoir is significantly smaller than that of the iCoffee models and some others on this list at a capacity of just 40 ounces. It does come equipped to let you use your own coffee—not a K-Cup—though, so you’ll get a little freedom from that. There’s a charcoal water filter to keep your coffee tasting as fresh as possible. On the carafe side, you’ll be able to brew 12 cups at a time and choose between regular or bold strengths. There’s another charcoal water filter here, plus a gold toned coffee filter to make sure your coffee tastes great. 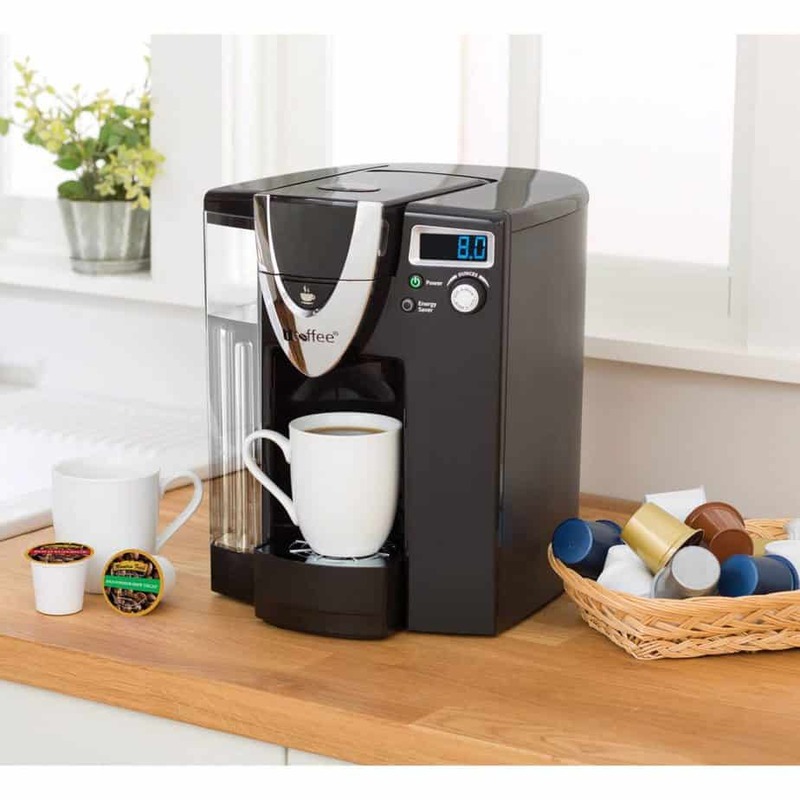 There’s also the Hamilton Beach FlexBrew® Single Serve Plus (or Single Serve with Removable Water Reservoir) to consider. (Read my full review here!) 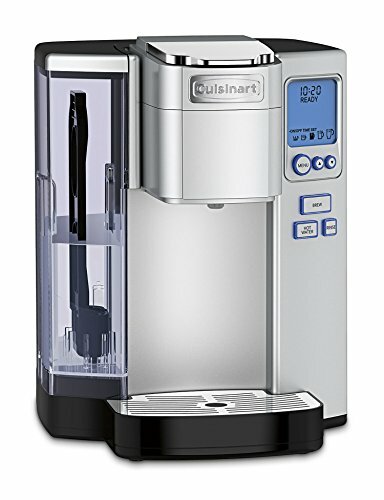 It won’t cost much more than the iCoffee Mozart or Opus coffee makers, and you’ll be able to get your hands on one much more easily. The Plus is about $60.00 and the one with the 40 oz. removable water reservoir is about $80.00. Use K-Cups or your own ground coffee in it; it’s versatile like that. You can even use paper filters and/or make a little more coffee at a time, too—14 ounces for a travel mug. It also automatically shuts off when it’s done. Either of these will be easy and intuitive to use. You can also choose between regular and bold coffee strengths. iCoffee Mozart vs Opus? Neither. Go with one of the options listed above or venture out into new territory and try something totally different. There are too many strikes against the iCoffee models because they’re out of business now. Other models have a nicer aesthetic and perform just as well, without risk of not being able to get support or new parts.